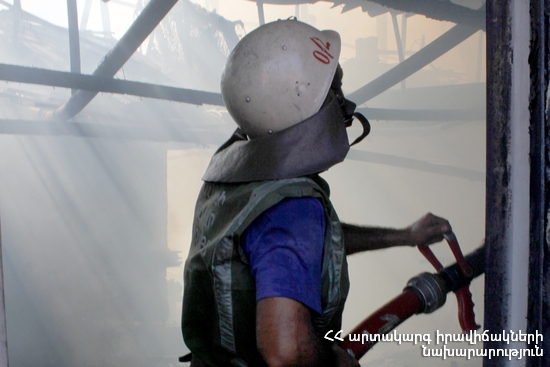 On April 12, at 06:06 an emergency call was received to “911” service that a fire had broken out in a furniture workshop situated on the roadway from the crossroads of Argavand to "Zvartnots" airport. Four fire units from the fire and rescue squad of the rescue service and the duty group of the Center of Disaster Medical Treatment of MES of RA dispatched to the scene. It turned out that the fire had broken out at 83 Isakov avenue. The fire was isolated at 06:39 and extinguished at 07:22. Household items, waste, wood and 2 windows burnt in the storage room (about 65 m2) on the second floor of a house, as well as about 30 m2 of the suspended ceiling burnt in the kitchen.